See that mechanical beauty above? 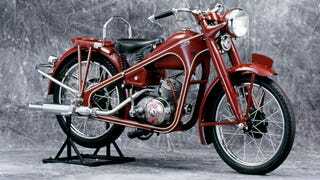 That's the Dream Type-D, the first mass-produced motorcycle from Honda. It came with a 98cc two-stroke single putting out 3 hp and weighed as much as a malnourished hummingbird. Sixty-five years later, Honda has sold its 300 millionth motorcycle: a 900-pound, 1,832cc behemoth with iPod connectivity.